ABS is headquartered in San Francisco, but has a large presence and office in Carmel, IN. 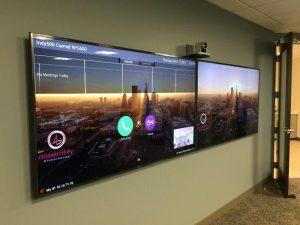 ABS called in Ultimate Technologies Group because it was remodeling its Carmel, IN offices, including its Boardroom. There were issues with the controls in the room not working. For communication, they were doing conference calls with poor microphones causing these communications to be subpar. Upgrade technology quality to today’s standards. Video conferencing would be added along with a significant improvement to sound quality. Shure ceiling microphones were installed in the ceiling to drastically improve sound quality. 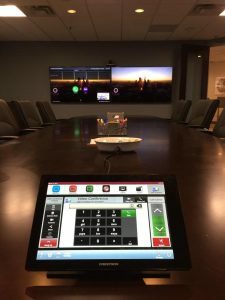 Video conferencing capability was added through product from Polycom. Crestron Air Media was installed to allow for wireless connection from laptop to display. The project was completed a day before the next Board meeting and everything went very smooth. The Board commented on how amazing the sound was in San Francisco due to the new mics. The video conferencing was also well-received by the Board. Wires were significantly reduced and gave the room a much more clean look. Most importantly, there were no longer failures of the system during important meetings.